This delicious curry dish makes for the perfect mid week meal. Place the chicken on a baking tray, drizzle with 1 tablespoon of oil and season with salt and pepper. Bake in the oven for 15 minutes, then remove and cut into bite sized-pieces, discarding the bones. Heat the remaining tablespoon of oil in a saucepan set over a medium-high heat. Add the onion, if using, garlic and ginger and cook for a few minutes, stirring to make sure the vegetables don’t burn. Add the red curry paste and cook for 3 minutes, then pour in the coconut milk and bring to a gentle simmer for 5 minutes. Add the diced chicken along with the sweet potatoes, carrots, bell pepper, lime juice and honey and continue to simmer for about 15 minutes, until the sweet potatoes are cooked through. Meanwhile, to toast the cashews, spread the nuts on a baking tray in a single layer. Put them in the oven for a few minutes, until they start to turn golden. Tip the nuts out of the tray and set aside. 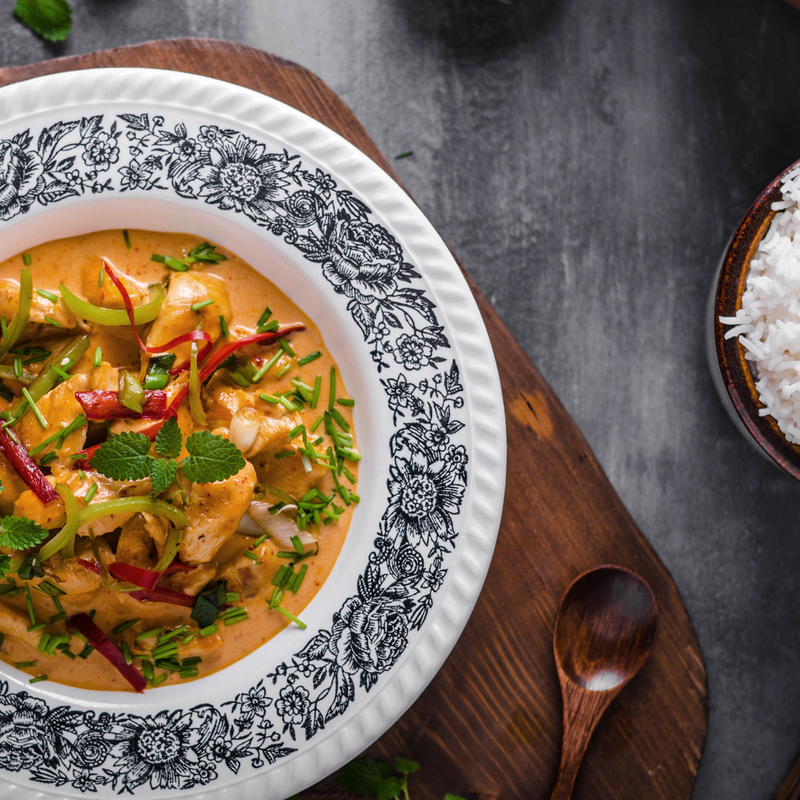 To serve, stir in the chopped coriander and basil, ladle the curry into bowls and garnish with toasted cashews.